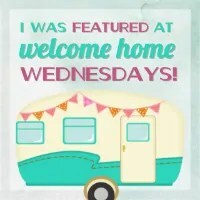 Welcome to Welcome Home Wednesdays #101!!! As you read this, I’m floating at the lake in a houseboat. Hopefully relaxing, but with 15 people on board, that might be tough 🙂 I’ll letcha know when I get back! Here’s what I’ve been up to this week – It’s always good to be organized around the house in time for back-to-school! Like any good hosts we’re sitting right by the present table waiting until our guests leave so we can go through the loot… the loot being your Welcome Home Wednesdays #101 links! We can’t wait to check out what you’ve left for us. Trust me there will be a lot of pinning, tweeting and facebook sharing going on in the near future… we can’t wait to show off what you’ve left! Hi Erin Thanks for featuring my Wax Paper Graphic Transfer Method. A nice surprise. Thank you for coming, Carol! Thank you Erin for co-hosting your no. 101 Welcome Home Wednesday. Have a great summer week ahead. Joy, it’s a pleasure seeing you here week after week! Thank you Erin for co-hosting. Hope your week is great! Thank you so much for featuring my dresser makeover this week! Of course! You did a great job! Thanks for partying with us and thanks for leaving a comment! See you next week! Thank you for hosting another great party! I’m so excited to be launching my very first Interview Series – called LIVING WITH PASSION. (#119) Please check it out and let me know what you think. In this first edition, I’m interviewing the Meeks family, Texan expats who gave up the American Dream to raise their family abroad.